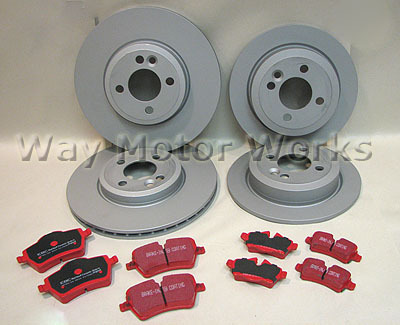 WMW EBC Redstuff brake package for 2007-2012 R55 R56 R57 R58 R59 MINI Cooper S, Clubman S, Coupe S, Roadster S, and Cabrio S. This brake package was put together for the owner wanting brakes that perform without breaking the bank. This brake kit will also cut down on brake dust significantly. The redstuff pads offer great cold bite for initial braking, and can also handle more heat during hard driving. Then we added good quality zimmerman rotors. They won't warp, and rust like cheap rotors, but still handle your braking. Choose options below to add the brake rotor retaining bolts and/or brake pad sensors to the package.